Rewind back the years with this retro cassette tape stationery holder for your desk. Separate compartments to hold your pens, paper clips, pushpins, scissors and more. Includes one roll of tape only. Perfect for use in office, at home and as gifts to music lovers. 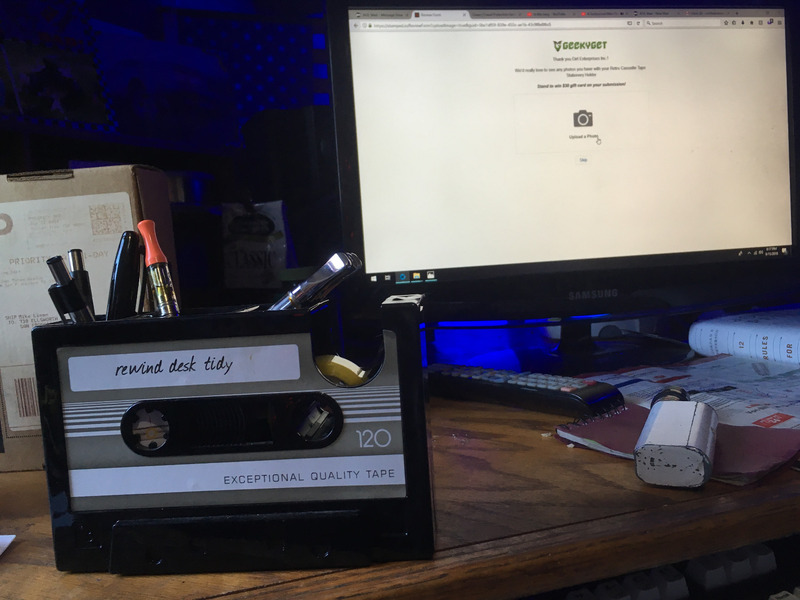 Aptly named as Rewind Desk Tidy, bring on pure nostalgia with this Retro Cassette Tape Stationery Holder. Store up to 30 pens and pencils as well as small stationery items such as pushpins and paper clips in each individual slot. This stationery holder also doubles as a tape dispenser and comes with one tape roll included. Awesome, only issue is the tape that came with it was **** quality, should be better for the price, also shipping took a while, but, overall good! This is a very cool gift. Its not small, its a good size and made well. My co-workers loved them. Yes it was. We loved them. My replacement cassette desk tidy arrived all safe and sound! Thank you for replacing the damaged one so quickly. You guys at Geekyget give great customer service and are a pleasure to do business with! Your products are fun too?!! Thanks again.